Once you begin to track a habit, you will become more aware of it and of how often you participate in it. After a week of tracking, you will likely begin to cut down on the number of times you entertain your habit, simply because you don’t really want to pull your notebook out and write it down. Here’s a bit of added motivation: think of all the money you’ll be saving by cutting down on your habit! Grab a notebook, pick a habit, and write down: “I am going to start tracking [habit] on [date]. 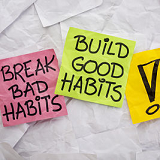 It’s best to pick the habit that has the most control over you; for example, if you’re addicted to cigarettes and want to quit, pick smoking as your habit. Also remember to write down the date you are going to start tracking your habit! Track your habit on a fresh page every day for three weeks. Write the date on top of the page at the start of a new day, and track your habit! For example, if your habit is smoking, write down the exact time at which you take your smoke breaks.